The son of X-Man Scott Summers and a clone of Jean Grey, Nathan Christopher Summers was infected with a techno-organic virus as a baby. He was only saved by being sent through time, subsequently spending his formative years in the far future where he became an unlikely and largely unwilling savior of assorted humankinds against mutant overlord Apocalypse and his vile minions such as the clone-warrior Stryfe. Hope Spalding-Summers was the first Homo Superior born on Earth after M-Day, when the temporarily insane mutant Avenger Scarlet Witch used her reality-warping powers to eradicate almost all fellow members of her terrifying sub-species from existence. Considered by many to be some sort of mutant messiah, the newborn girl was “appropriated” by militant warrior Cable – no stranger to the role of Sole Saviour – who raised her in the furious future, training her in all manner of lethal survival skills before she inevitably found her way back to the present where she was adopted by X-Men supremo Scott Summers AKA Cyclops. 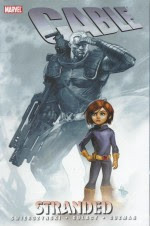 With the entire time-busting saga scripted by Duane Swierczynski, the action here begins with the 2-part ‘Too Late for Tears’ – illustrated by legendary comics icon Paul Gulacy – as Cable and nine-year-old Hope prepare to again jump into the safely camouflaging corridors of chronality after a particularly contentious battle. Just as Cable forces back his latest bout of all-consuming transmogrification by invasive code, Bishop arrives and a deadly destructive but ultimately inconclusive battle breaks out. The follower’s plan is obsessively simple: as soon as he sees Hope he will end her by detonating a nuclear device inside his body. The seemingly benevolent holy man has no problems wiping out his entire flock to finish her for good but Hope perpetually avoids him and Bishop just can’t trigger the nuke until he’s absolutely certain. Artists Gabriel Guzman & Mariano Taibo take over for the eerie alien encounter ‘Brood’ beginning with ‘Bishop Takes Pawn’ wherein Bishop and Emil lead their people into a final battle with Cable’s ship and crew on the edges of the solar system. Thankfully the boy finds Hope before the mutant hunter does and she convinces her long-lost paramour of the deranged cleric’s true intentions before falling to Bishop’s murderous rage. Time-travel tales often disappoint and frequently make people’s heads hurt, but this bombastic romp (augmented by covers and variants by Dave Wilkins & Rob Liefeld) manages to always stick to the point, offering sly tributes – and some not so much – to Les Miserables and Alien whilst following the pain-wracked consumption of Cable by of his own non-fleshly invaders through a clever and poignant Fights ‘n’ Tights sci fi horror drama that will impress and delight older fans of the genre(s).